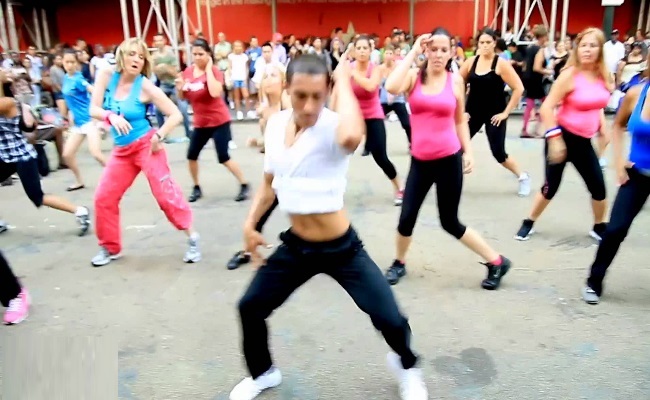 In recent times, Zumba is actually gaining more cult status around the world and celebrities from Hollywood too, are mesmerized by its benefits. But, what actually is Zumba? It is a fitness method through dance which has it’s roots in the dance forms of the classic Latin. It is a form of dance which effectively provides full body workout which includes improvement in the footwork, loosening up of the shoulders and neck, engaging of core muscles and stretching of calves and ankles. The choreography comprises of various dance forms and is best known for its weight loss abilities. We present you 5 such basic dance steps of Zumba that will keep every muscle of your body engaged. Comprising if Latin moves and rhythms in the workouts, Salsa is the fundamental move of the Zumba dance. It is also one of those prominent workouts in aerobics that include vigorous movements of leg and also swift moves. 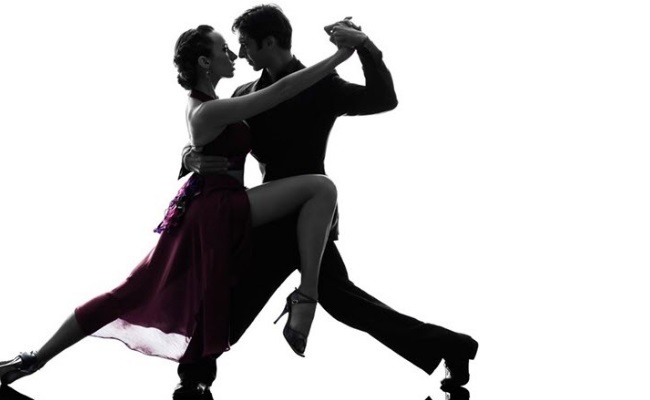 Salsa, as a part of Zumba, is all about the leg movements just like in the Latin dance wherein you put your right foot ahead and get back to the start, switching the weight to the other leg. This movement is always in quick succession. With your feet closed, stand straight. Further, stepping to your right and bending the right knee, get back to the initial position. Next, stepping to the left, bend your left knee and get back to initial position. Keep repeating this while you gradually pick up the speed and try recurring the moves faster and faster. You could also rock your body side to side. Loosen up your body so that you can experience the rhythm in the music. 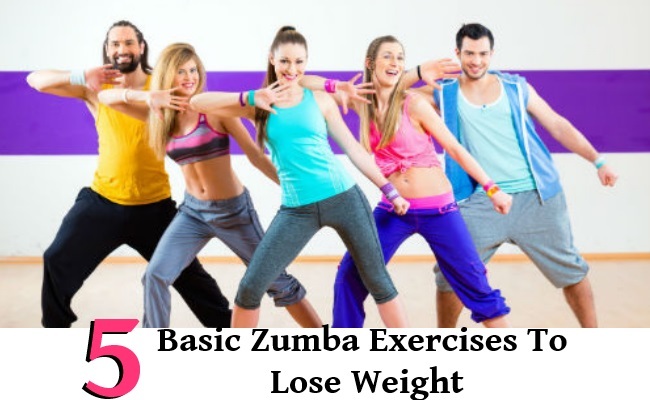 Since you have learnt the basic salsa moves which happen with you standing in one place, you can move on to learn the traveling salsa moves which is an integral step for beginners in Zumba. The move includes coherent working of hips, arms and thighs simultaneously. With feet touching each other and arms on your sides, bend the knees slightly an take four steps to your left, shaking your hips and directing your hands to your left. Next, change the direction and take four steps to your right, swaying your hips and directing your hands to your right. Keep increasing the tempo, as you get acquainted with the moves. This is again a dance from the classic Latin which is included in the Zumba dance workout. Being one of the fundamental Zumba steps which is similar to a March along with swaying of arms and hips. It is vital to make a note that in the Merengue dance form, the left hippops up whole the right foot steps, and the right hip pops up as the left steps. Maintaining a strong posture throughout the dance is crucial. Keeping your feet together, stand straight. Bend your right knee and step up the right foot simultaneously swaying out your left hip. Get back to the initial position and this time, Bend the left knee, stepping up the left foot simultaneously swaying your right hip out andreturn to theinitial position. Keep repeating the move in quicker successions and slowly increase the speed as if you are marching back and forth. It is another important part of Zumba workout and I’d popular as the Latin version of hip hop dance filled with power and energy. Basic reggaeton requires you to take a step right and then get the left foot to touch the right, and repeating the same the other way. You could also pitch in some movements of arm if you wished as little variation. With your feet together, stand stiff. Bending your right knee, move the right arm to your side, directing towards the ground and bend the left arm to get it in front of your waist. Get back to the initial position and repeat the same with your left knee. Point your arm to the ground while you move them and bring the right arm which is bent in front of your waist. Repeat the entire thing in faster moves. This is again an exquisite dance form from the Latin which is included in Zumba. It aids in working of the muscles in the hip and developing posture, also improving the grace to present you in an appealing stance. With your feet together, stand stiff. Move to your sides, starting with the left side while you dig your right heel to the ground and later getting the right foot behind the left and digging the right toe to the ground. Take small steps with left foot to move to the left and later get back to the start. Repeat it to your right side and increase the pace. These basic moves will work your body and you will put off those extra kilos!